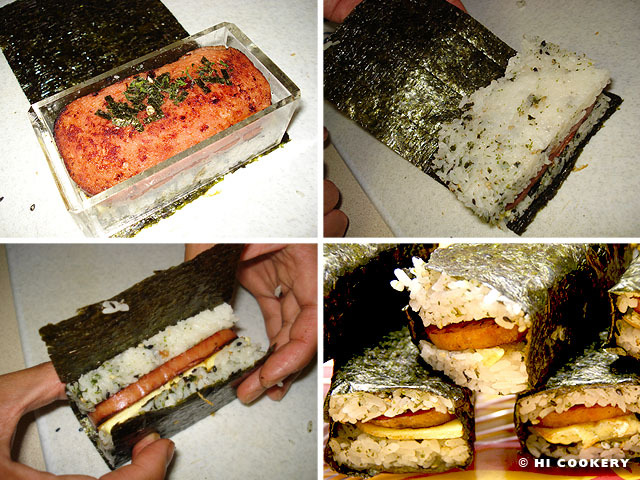 Islandah, her bruddah, Kahuna, and all der frenz go pupule ova one brick-lookin ting called Spam musubi. Da kine get rice and can meat insai one dry seaweed and da haoles tink det no sound too good. But Spam musubi brok da mout cuz is onolicious fo one wikiwiki kaukau. 7-11 , manapua trucks and odda places sell’em all ova da islands and Hawaiian-style restaurants on da mainland geffum on der menus, too. Waikiki get Spam Jam ere April fo help da needy and the festival is good fun cuz get hula, music, games and plany Spam stuffs! 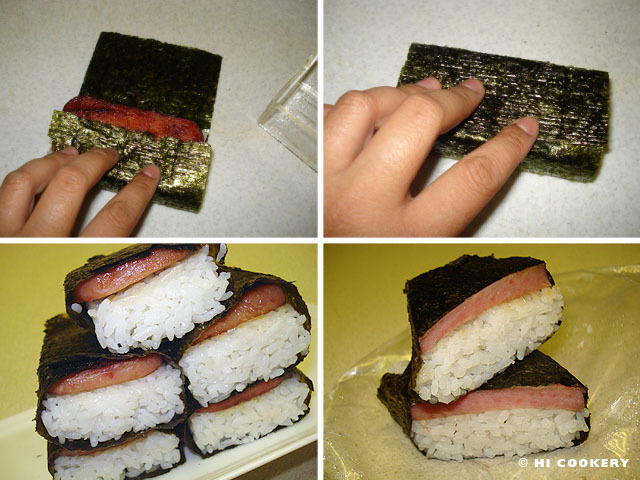 When Islandah make Spam musubi at home, Highlandah go eat’um too. Is special fo experience one true local kine food of Hawaii. So we wanted fo share da aloha by posting our ohana recipe fo Spam musubi during National Canned Food Month. 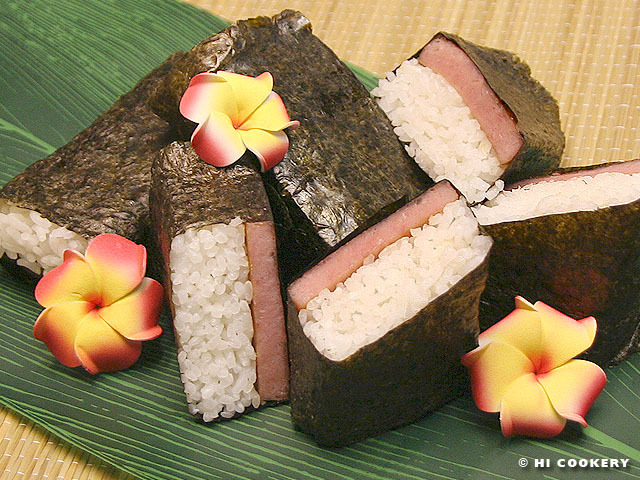 Spam musubi is a quintessential local food in Hawaii. 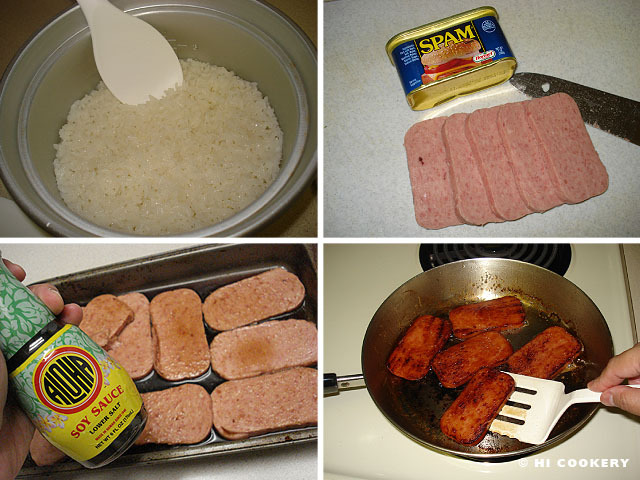 Known as “Hawaii’s unofficial state meat,” Spam became popular during World War II because a portable, durable, alternative product was needed when meat was a scarce commodity. According to Hormel Foods Corporation, the company that has made Spam since 1937, Hawaii more than any other state in the nation has the highest statistic for their product’s per-person consumption. It is estimated that more than seven million cans of Spam are eaten every year in Hawaii! Waikiki now holds an annual festival, Spam Jam, every spring to help the needy through the Hawaii Food Bank. 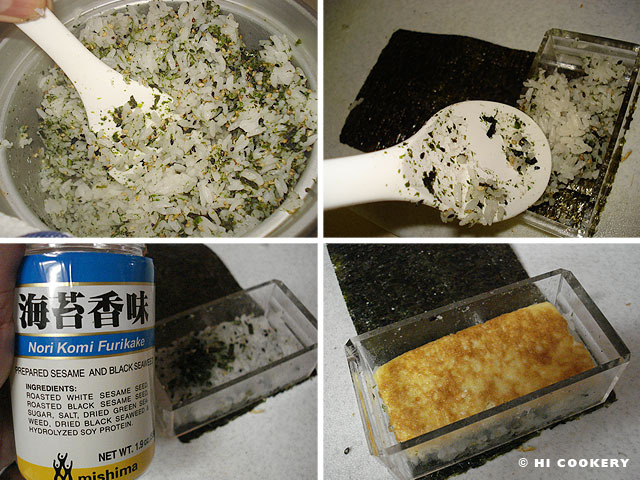 We have provided a basic recipe for Spam musubi with another variation containing egg and dried seaweed sprinkles (furikake) below. Make a musubi meal out of “SPiced hAM in a can” for National Canned Food Month. Wash and cook the rice. Let cool. Slice the Spam lengthwise into 5-6 pieces, about 1/3 inch thick. Dissolve sugar in soy sauce. Use this mixture to marinate the Spam slices for about 10 minutes. Fry the marinated Spam for a few minutes until a brown glaze forms over them, being careful not to burn them. Prepare to assemble the musubi. On a sheet of nori, place the musubi mold in the middle of it. Layer the rice on top of the nori, then press flat. Top it off with a slice of Spam. Remove from the mold. Fold one end of the nori onto the Spam. Fold the other end of the nori over to seal with a little soy sauce or water. Turn it over seam-side down and set aside. Continue assembling the rest of the musubi. 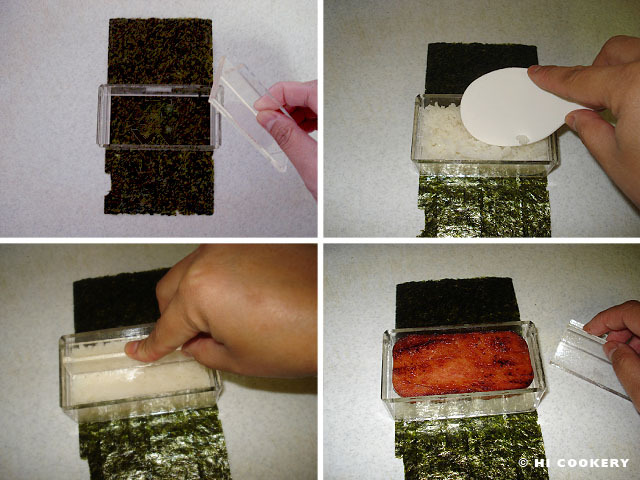 Wrap in clear food plastic to help the Spam musubi hold its shape until serving. 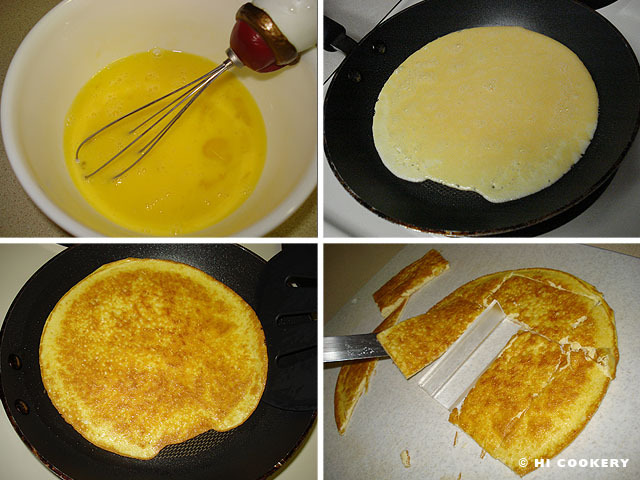 Whisk the egg until frothy and fry in a little vegetable oil until both sides are golden brown. Blot the grease from the egg with paper towels. Using the musubi mold as a guide, cut rectangle shapes from the cooled egg. Set aside. In a bowl, sprinkle 2-3 tablespoons (or to taste) of furikake in the cooked and cooled rice and mix well. On a sheet of nori, place the musubi mold on it. Layer the furikake-flavored rice on top of the nori, then press flat. Place a slice of egg on top. Add a slice of Spam on top of the egg and sprinkle with a little furikake (optional). Press down with more furikake-flavored rice. Remove from the mold. Fold one end of the nori onto the Spam. Fold the other end of the nori over to seal with a little soy sauce or water. Turn it over seam-side down and set aside. Continue assembling the rest of the musubi. Wrap in clear food plastic to help the Spam musubi hold its shape until serving. Spam is trademarked by the Hormel Food Corporation as SPAM. The canned luncheon meat is not to be confused with spam, which is defined as unsolicited or undesired electronic messages. Although it is not yet widely recognized, July 5 is being promoted by a Facebook group to make it National Spam Day. Monty Python has a popular sketch and a song about Spam which spawned “Spamalot” (Tony award-winning Broadway musical). Weird Al Yankovic sings a parody about Spam. And Hawaii comedian Frank DeLima also sings a parody about Spam musubi. For another post in pidgin and a local-style recipe, see our entry for Hawaiian hurricane popcorn on January 19, which is National Popcorn Day. Spam musubi mo’ bettah. It’s no ka oi! Don’t I wish I had visited Hawaii during the Spam Jam!! its ono when you add a little mayo on it. makes it moist.